Above Photo: Affordable housing for women workers in Solapur, India. Credit: Centre of Indian Trade Unions (CITU). Utopia lies at the horizon. When I draw nearer by two steps, it retreats two steps. If I proceed ten steps forward, it swiftly slips ten steps ahead. No matter how far I go, I can never reach it. What, then, is the purpose of utopia? It is to cause us to advance. In an age of Trump and trolls, it may be strange to talk about utopia. Not only has a divisive reactionary right-wing privileged minority surged to the fore, but social inequality, militarism and the climate crisis have worsened too. There does seem, however, to be one arena for hope for progressive solutions and that is in the city. Worldwide, mayors are increasingly a progressive and fearless voice advancing bold agendas on climate change, welcoming refugees and trialling new forms of democratic participation. The question remains: can these cities offer solutions that address multiple systemic crises instead of pursuing, as Greg Sharzer suggests, a “way to avoid, rather than confront capitalism” by focusing on “piecemeal reforms around the edges”? Can a group of cities really offer any fundamental solutions to a crisis created by the immense power of corporate capital? To try and answer this question, the Transnational Institute in 2017 launched Transformative Cities, asking communities to share their stories of radical transformation, in particular in the areas of water, energy and housing. Our research, particularly in the areas of water and energy had revealed a significant global counter-trend to privatisation, showing that 1,600 municipalities in 45 countries had brought their public services under public control since 2000. We wanted to explore this more deeply to see whether and how cities could be part of building systemic solutions. American sociologist Erik Olin Wright, in his assessment of strategies for confronting capitalism, says that we need to escape from delusions that we can either overthrow capitalism or tame capitalism – arguing that the answer is to erode capitalism. He argues for the building of “real utopias” which are constructs that have “the potential to contribute to eroding the dominance of capitalism when they expand the economic space within which anti-capitalist emancipatory ideals can operate”. As we argued in a previous piece, cities offer many advantages for pushing forward these kinds of radical emancipatory ideals, that in the language of this initiative we call ‘transformative’. At the same time, it is clear that what ‘transformative’ looks like will vary radically according to the context, the culture, and the process. Cities may make transformative changes in one area and still be regressive in others. As the Zapatistas have cogently argued and shown in practice, the revolution depends on stepping out and asking questions as we move forwards (Caminando preguntamos). We have a clear analysis that the key crises we face are due to a capitalist system of production that has concentrated economic and political power in the hands of transnational corporations and a small elite while bringing our ecological systems to a dangerous point of collapse. However, we have an open mind regarding what the truly transformative city and politics looks like. The Atlas of Utopias. Credit: TNI 2018. 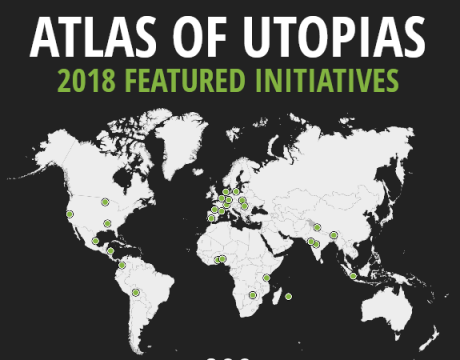 As a result of the call, TNI is today presenting its Atlas of Utopias, telling the stories of 32 communities from 19 countries, ranging from small peri-urban indigenous communities in Bolivia to major urban metropolises such as Paris. Their contexts are starkly different, and their initiatives vary widely in terms of time, scale and impacts. Thirty-two cases are also just a tiny snapshot of the range of exciting transformative initiatives taking place around the world. Organising locally can take on corporate power and national governments. It would seem that the balance of power between local governments and the national government and multinational corporations would make victories difficult but, in many cases, determined campaigners have defeated both. They have done this by taking advantage of people’s loyalty to their city, their greater control over local policy and by naming and shaming corporations and their failures to run city services effectively. In Berlin, for example, residents took on the federal government as well as the multinationals RWE and Veolia that did everything they could politically and legally to block remunicipalisation of the city’s water. Eventually political pressure – including a referendum in which 98% demanded that the government publish secretive contracts – led to water remunicipalisation in 2014. Organising around access to basic rights such as water, energy, housing can engage many people and be part of a bigger transformation including tackling climate change. The advantage of organising around tangible issues such as energy or housing is that these are essential to everyone’s daily life, which is why these struggles have been so emblematic to the rise of municipalist movements everywhere. They also can be an opening to building a bigger progressive radical agenda. In Richmond, California, initial protests against air pollution by the Chevron refinery has led to a surge of support for the Richmond Progressive Alliance, their election to the council and a sea of change in local policy. This oil company town has subsequently raised its local minimum wage, brought in rent control measures that protect 40% of Richmond tenants, and rolled out successful community policing led by a visionary gay police chief. In Nicaragua, an association of rural development workers not only organised to build a community hydro to provide electricity to a rural population for the first time, it used the income from its surplus electricity to create an additional US $300,000 of revenue for investment in further development projects for the region. Worker engagement is usually critical to transformation. As Hilary Wainwright has argued, workers are not just important for their bargaining power against capital, they are also uniquely positioned because of their knowledge and experience in running services and their pivotal role within community relations. Remunicipalisation and transformative practices work best when they can draw on this knowledge and creativity. In Jamundi, Colombia, the local trade union has not only stopped the privatisation of water, but has also become a fierce defender of the human right to water, developing four community water systems. In Mumbai, India, former mill workers have succeeded in staying mobilised even after the mills closed and have won the construction of 26,000 homes for workers. They have successfully challenged and defeated real estate developers who sought to build malls and luxury housing. Changes in one city can inspire many others. Many cities report that their actions have led to interest by many others and therefore sparked changes way beyond the community. Grenoble’s bold water remunicipalisation in 2001 – that included high levels of citizen accountability, social tariffs and ecological measures – inspired Paris to do the same. In Mexico, a special school has been set up to encourage lawyers, engineers, accountants, geographers and teachers in 16 states to defend public water for all, helping ensure that good practice becomes viral. The victory of the citizen-movement platform Barcelona en Comúhas similarly sparked a new wave of municipalist movements worldwide. This perhaps answers one of Olin Wright’s challenges for establishing real utopias – the need for these networks to expand so that they can be in a position to challenge ‘the dominance of capitalism’. In the next month, we plan to explore nine cases in more depth, sharing their process of change. Then in mid-April, the public will be invited to vote on their favourites. In addition, we have been working with a number of evaluators to draw out the learning which will be turned into publications in a variety of media formats to inspire and assist other communities involved in the same struggles. There is a lot to learn about both the individual cases, their durability in terms of transformation, and whether they contain the elements for eventually “challenging the dominance of capitalism”. The latter still seems very far off, and it remains an open question and debate over whether an ever-expanding municipalist movement will ever reach the position of challenging the hegemony of transnational corporations and client neoliberal states. What is clear already is that the first step for transformation begins when a group of people in a community decide to say no to the corporate takeover of public resources, and when they start to imagine an alternative. Throughout the atlas, we witness individuals and organisations who have dared to dream and who have trusted that people can make decisions more justly than corporations driven by profit. In the process, they are building the social relationships that can take on corporate capital and most of all creating the imaginary that another world is not only possible but is on the way.